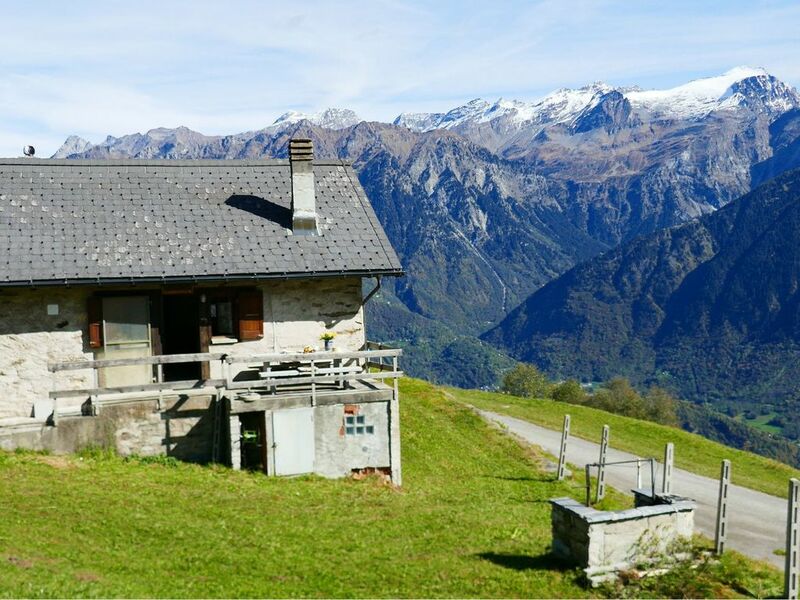 Gariva 20 km from Malvaglia: Rustic, simple single-family house "Baita Ficc", 1'480 m a.s.l., surrounded by meadows and fields. In the district Valle di Blenio, in a secluded, quiet, sunny position, in the countryside, south facing position. Private: natural state property 500 m2. Terrace, garden furniture, barbecue. In the house: storage room for bicycles. Motor access to the house (mountain road). Parking at the house. Grocery 15 km, supermarket 17 km, restaurant 15 km, railway station "Biasca" 27 km. Walking paths from the house 5 m. Nearby attractions: Museo della Valle di Blenio, Castello di Seravalle, Chiesa Negrentino, Archivio Doneta, Centro Pro Natura, Castelli di Bellinzona UNESCO, Monte Tamaro, Swissminiatur. Well-known ski regions can easily be reached: Nara, Campo Blenio, Campra. Well-known lakes can easily be reached: Lago di Luzzone, Lago Retico, Lago Maggiore, Lago d Lugano. Hiking paths: Nara, Campo Blenio, Lucomagno, Valle di Blenio, Leventina. Please note: car recommended. Baby equipment on request (extra). Animals in the neighbourhood. "Baita Ficc", 2-room house 58 m2 on 2 levels, south facing position. Partly with sloping ceilings, practical and rustic furnishings: open large living/dining room with open-hearth fireplace, dining table and satellite TV (flat screen). Exit to the garden, to the terrace. Open kitchen (4 hot plates). Shower/WC. Wood heating. Upper floor: (steep stair), 1 open large room with sloping ceilings with 1 bed (90 cm, length 200 cm), 1 french bed (1 x 160 cm, length 190 cm), 2 double beds (1 x 160 cm, length 200 cm). Terrace furniture. Marvellous panoramic view of the mountains, the valley and the countryside. Facilities: children's high chair, baby cot for up to 2 year olds (extra). Please note: non-smoking house. 1 pet/ dog allowed. Fire extinguisher. Power is supplied by a solar panel and generator. Stove is powered by gas. Appliances over 250W can not be operated. Important note to note: mountain road 20 km from Malvaglia in real time 40 minutes.